After filmmaker Albert Nerenberg and his wife suffered through deaths in the family leading up to the birth of their first child, he found that he had “lost his laugh.” Like all dedicated creatives, he let his own life experience serve as inspiration for a new project – an investigation into laughter – where it comes from, why we do it, how we do it, and it’s numerous benefits. 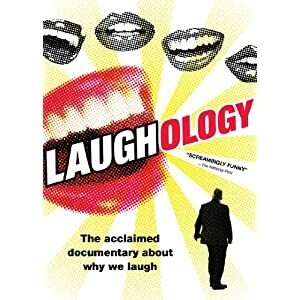 The result is the 65 minute documentary Laughology, an endearing almost-feature that lightly delves into the world of laughter. As Nerenberg travels, he meets and presents Doug Collins (dubbed “the man with the most contagious laugh in the world”), the Laughing Yogi, Dr. Kataria – a doctor who truly believes that laughter is the best medicine, Professor Robert Provine who, as Nerenberg says in the film, literally wrote the book on laughter, and many others. He visits an Inuit tribe where laughter is said to have helped them survive the tough climate, Tanzania – where people have been struck by the “laughing epidemic,” and many other places. While traveling the world in search of interesting laughter-related stories, Nerenberg mostly stays off camera, interviewing subjects rather than presenting information himself. When he does appear, he’s always wearing the same nondescript suit – a sign that he knows to create a familiar narrator throughout the film in order to help provide a throughline to the story. Overall, this is an effective and enjoyable documentary. I’m not sure it completely accomplishes what it sets out to do at the beginning, but it does give a detailed account of the history of laughter and delves into many interesting facets of laughter in general. Those with an interest in human interaction and mood will find a lot to appreciate here but some may find the film a bit rushed and disjointed. If nothing else, Nerenberg is a likable host and with his history of documentary filmmaking, he should eventually become a more well-known name. The special features included on the disc are the trailer for the film and five extended scenes from the movie – including almost 10 minutes with the Laughing Yogi that is especially memorable. No user commented in " Movie Review: Laughology "